When searching for that perfect housewarming gift, how about a Plant-Me-Pet? They're the weirdest looking things, but when you learn that their bodies are made of natural latex, eyes of seeds and they squeak...it'll make you want to shove one in some dirt. With just $20 and a little soil, a few months later...you'll have a pumpkin, tomato or a melon plant! Cool. This past holiday season while shopping for wrapping paper, I over heard a guy tell his girlfriend, "get the penguin paper...penguins are so in." 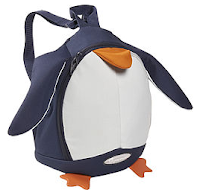 Right he was, so in light of "March of the Penguins," "Happy Feet" and penguin wrapping paper, I thought this Samsonite backpack was the perfect way to fit the trend. Chic and stylish, but still absolutely adorable. Buy it for your little one here. Velocity Art and Design is an amazing website out of Seattle that offers unique trinkets and uncommon pieces of art. Miniature disaster building replicas to owl inspired throw pillows, this site is a one stop shop for that totally far out item. I am always looking for sites that are not intimidating...where there just may be something to learn. I stumbled across an interview with Wal-Mart exec Andy Ruben on Green Options and I thought to my picky self, "what a great site." It wasn't a lengthy, drawn out, completely politically driven interview. It got straight to the point about how Wal-Mart is trying to do their part around the environmental crisis. With that, I started snooping around and discovered that it's a fabulous little source of beautifully "green" information. Info I can really use and implement into my life. With "Tip of the Day" and a "Green Life Guide," I felt a wave of happiness to have found such a gem.